« Is the Forest of Bowland about to become a possible Raptor Free Zone? 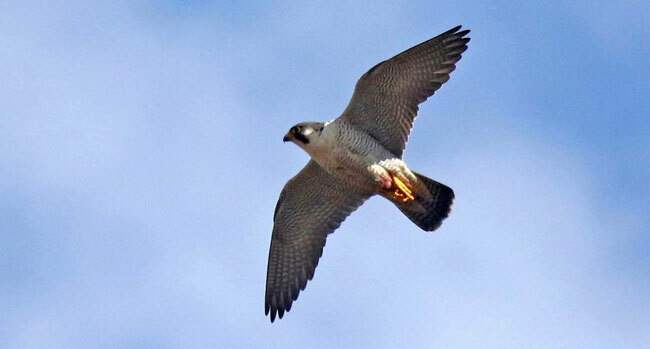 The unique image depicted below was taken of a male peregrine falcon flying close to an active nest after it had been shot and possibly fatally injured in the northern Pennines today. The male in the image was the mate of a female known to be incubating a clutch of eggs at this nest situated adjacent to a red grouse moor. There is little doubt this peregrine, because of the gun shot wounds to the legs and abdomen (covered in blood) will possibly be dead by morning, or within the next 24 hours at the latest. The female sitting on the eggs will almost certainly desert her clutch of eggs to search for food, leaving her eggs to chill. We urge all our followers and anyone else who received this article to retweet and pass to all other social media outlet, including Facebook, we need this image to go global to show the world how protected birds are treated in Britain when they nest close to, or upon moorland where red grouse are shot. The world must see this image, please keep retweeting. Please also pass this information to anyone else who may have a vested interest in preserving our wildlife, for example our wildlife conscious Prime Minister Mr David Cameron. Please bear in mind 72 pairs of peregrine, which include 22 pairs lost from the Forest of Bowland in the last 6 years, have already been removed illegally from Red Grouse moorland in northern England. This figure does not include any immature peregrines which have attempted to recolonise a number of these abandoned sites which have themselves been killed. This incident should convince everyone with an interest in protection of birds of prey to sign Mark Avery’s e-petition to ban Driven Grouse Shooting. The shooting of this male peregrine so close to its nest is indefensible, a truly despicable act. If shot close to a grouse moor as claimed, it underlines the shooting communities hypocrisy. We must all support Mark Avery’s e-petition calling for a total ban of Driven Grouse Shooting. Please everyone, retweet this very sad story. Where in the North Pennines? Has the body been examined to rule out injuries caused by a territorial fight or collision? Can the writer and commentators please advise readers when the technology was made available to carry out an autopsy on a living bird whilst in flight? I suggest that this article has gone a little further to highlight the hypocricy within the raptor and bird groups rather than within the shooting community. Yet another load of baloney undermining the conservation work of many. It is no wonder that many people are starting to dismiss your reports. How do you know for sure that it’s been shot? Looks like there Peregrine has blood from a kill on it. If it was shot a leg or both legs would dangle. Kinda suspicious when one states its fatally shot yet there is no evidence of a carcass. Falcons and other birds of prey often mantel over a kill and often get blood on their feathers. I am very suspect of this photo since there is cry for banning something involved. It’s exactly what we’ve come to expect from the criminal grouse shooting fraternity, not one single legally protected raptor is safe while the grouse shooting estate owners and their gamekeepers continue to be allowed to get away with these blatant wildlife crimes. The police just sit twiddling their thumbs and turn a blind eye because the chief constables are afraid to upset the establishment. LIES LIES LIES. this bird has blood on its legs from a kill, most likely going on a return from the nest back to the kill to transport more food. How do you know it’s been shot without handling it or having it x rayed? All I see is a photo of a peregrine. I can’t see evidence of what the headline states “returning to active nest site” ….. Don’t see that. Headline states “after receiving fatal wound” …story states, “possibly fatal” , one contradicts the other. Where’s the evidence it’s a tiercel? It could be a female, prolapsed. All speculation, carefully worded to fool the reader. Similar to any photo of mark avery walking along the street with the headline…..mark avery pictured leaving local crack house on way to rob local post office while wearing woman’s underwear under his suit. That is not a shotgun wound, looks to me like it has flown into a wire or something, a shotgun would more than likely killed it. Perhaps not as conclusive a photograph as one would want to see. Especially as, as you can see from many of the comments, it gives the scum who are either actively involved in the illegal killing of birds of prey, or their apologists, an opportunity to pretend that they are law-abiding, misunderstood people and not the criminal psychopaths we all know them to be. In the north the number of peregrine and their nest sites is greater in limestone areas than in gritstone and sandstone areas. Could it be that heather does not normally grow in limestone areas? i.e. no grouse feeding on heather! They have been poisened to near extintction now they are being shot when are people going to be prosecuted for there actions? Whatever the explanation, I see no Talons on the bird and unless I’m mistaken, they are an essential necessity for the success of any hunting. Does a prolapse cause them to fall off too? So the headline could contain the word possible/probable. Would that make any of the moaning shooters any happier? Too many are glorifying in the fact it is alive. How will it provide food for survival? Well anyone doubting this photograph should go visit the one with a buffoon dressed in Camo armed and ready, whilst standing guard over a dummy male Hen Harrier. I think that says it all about these lying apologists for grouse shoots. As for grouse moors being better managed than ‘any’ RSPB reserve, well the statement is as laughable as the persons spouting this nonsense. These people managing ‘our’ uplands and persecuting raptors or nothing or nothing less than criminals, pure and simple. Sorry autocorrect error in last sentence. ‘These people managing ‘our’ uplands and persecuting raptors are nothing more and nothing less than criminals, pure and simple. Wildlife cobcious David Cameron…that is a joke isn’t it….the same Cameron that want British Buzzards killed in favour of introduced Pheasants’….so people like his father in law could have their shooting fun…clearly you know nothing about Cameron, he is a goon. Editor’s Comment. Graham, yes we did know about the Cameron family, it was our little joke to entice comments, Cameron will not do anything to conserve raptors, that we are agreed on and thats the reason we used his name. Thanks for your comment. The kind of people who own these estates are the very same who fucked up BHS and many other industries. Unscrupulous, callous and twisted shits. Could have collided with a wind turbine, or bird blender, as I prefer to call them. I hope the body is recovered so the true cause of the injury can be ascertained. Whether this article is misleading or not is almost irrelevant. Raising birds just to kill them for fun is something only a complete scumbag would do. Such scum have no morals and would do whatever it takes to protect their interests. No bird or other animal deserves to be treated in such a way. Those of you who think violence ifs fun, try kick boxing. We do not respect other living things. It’s all about power and control. It’s as if nothing else has the right to live. Time for a bit of balance here. I can guess that some of the gainsayers may well be from the shooting fraternity seizing the opportunity to rubbish any report that puts them in a bad light. But some of the comments do stand up to scrutiny. Obviously there is no forensics and no body for a post mortem. This is where the case falls flat. NEITHER side have any facts and this is where posts such as this simply won’t do anything for the cause of bird protection. Better it had not been posted at all. Only FACTS matter and these are very thin here. We have a beautiful bird with blood on it. It is still flying. We don’t even know if it was returning to a nest or where the photograph was taken. What is needed is a high definition enlargement for expert examination and a clear statement of where the photograph was taken and when. Until then we have nothing. It would be an honourable gesture if all shooting supporters who claimed vehemently, the male peregrine posted on this web site was suffering from a prolapse would write their apologies in the comments box below. For those followers who do not know, the second image of female peregrine posed by shooting interests on twitter claiming it as the same peregrine was false, the image was actually taken in Belgium and then maskeraided on twitter to mislead people. Shooting fraternity and honourable…. about as much chance of gamekeepers protecting the Hen Harriers and telling the greedy landowners to get fcuked! Sorry guys, but my anger levels are increasing with these type of folk, as I learn of further atrocities, which I am sworn not to reveal for now. Has this death been confirmed yet. Can anyone confirm that they have been to the nest and that the male is no longer there. Editor’s Comment. Sadly we have nothing new to add. 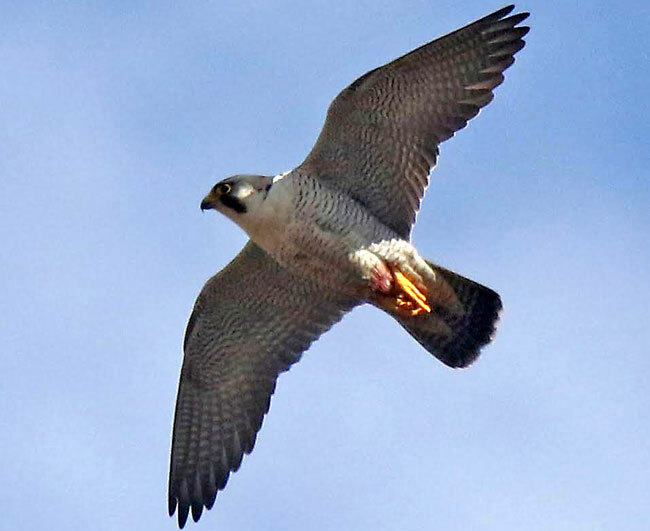 We received the image in good faith from a respected Cumbrian wildlife photographer who claimed the image he captured, close to an unnamed nesting site, was of a male falcon which showed signs of having been shot, we agreed with this opinion. If any more information is sent to us we will update the position, until then we must show patience.